Since we stayed in a lovely loft apartment renovated with eco-friendly material in Cap-Breton, plywood is fast becoming one of my favourite material. It has the benefit of being affordable while adding warmth and textures to an interior. As we are currently tackling two renovation projects and will re-design a flat in Paris next year, I thought it would be good to show you how to make the most of plywood. This small flat (800 sqf = 74 sqm) in Melbourne, was recently renovated with plywood by Clare Cousins Architects to provide enough space for a young couple expecting their first child so they would not have to move out. The Architect first reconfigured the space to maximise social area which would benefit the young couple’s family and social life and created mini bedrooms and then added large windows and raised the ceiling to increase the feeling of space (something we did when we converted our loft into a spacious double-bedroom with ensuite bathroom). In the lounge, the pendant light is the Muuto Unfold pendant light and the dining table is by Artek. You will find similar grey sofas at Made.com and John Lewis. I’m a big fan of Philippe Starck’s Master chair in black but if you’re looking for something more stylish, I highly recommend this beautiful plywood chair. They even managed to create a mezzanine loft guest room which doubles up as a compact workspace where they can fit a small desk. Talking of desks, I love this wall-mounted desk designed by Florence Watine. 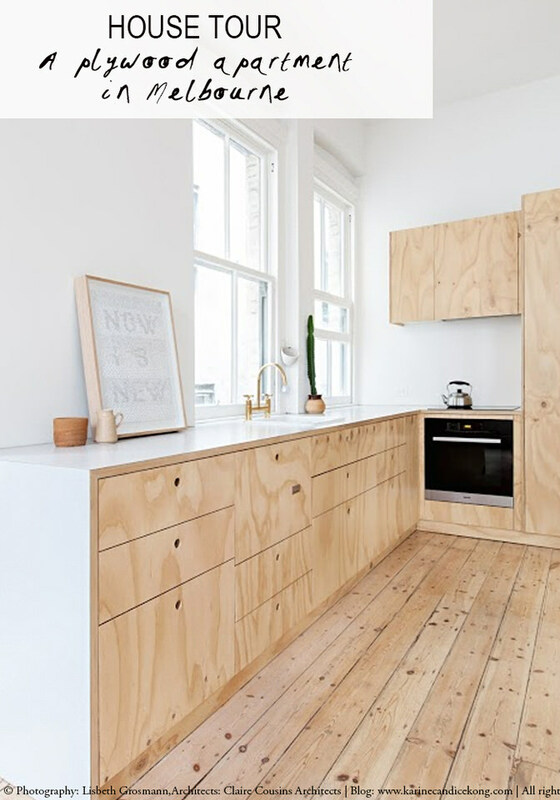 The open-plan plywood kitchen is one of my favourite area in this small but well-designed flat. It features an oyster gray Laminex countertop easy to care for, a Miele oven (the brand we went for in our home in London), a striking brass tap and plenty of storage. Brass accents are also used in the bathroom where the floor was creatively done with inexpensive Quarella Calacatta floor tiles. In the UK, we used tiles from Castelnau Tiles for this bathroom which I recommend. The wall-mounted sink is by Villeroy & Boch. This is absolutely stunning. I love the warmth all the wood creates! Such a great idea for an affordable apartment redesign :) I particularly love the kitchen!